All of us, rich or poor, satisfied or hungry will die. Our souls will go either to that place of torment—the netherworld, or to the place of comfort, or temporarily, to a place of purification. Lazarus was carried by angels to the bosom of Abraham, whose name in Hebrew means “the father of many.” In fact, the Church, in her funeral liturgy commends the soul of the departed with these words: “May Christ, who called you, take you to himself; may angels lead you to the bosom of Abraham.” At our death we are commended into the arms of the first person to acknowledge the One, True God, Abraham, our father in faith. Jesus directs this teaching to the Pharisees who believed in the resurrection of the body as opposed to the Sadducees who did not. These religious leaders would pay close attention to Jesus’ words, for He includes Abraham and Moses—whose name is Egyptian for “son” or possibly Hebrew for “deliverer.” These religious leaders were also wealthy and dressed in finery as did the unnamed man. These religious leaders also new Jesus was speaking about their unbelief when He states, “If they will not listen to Moses and the prophets, neither will they be persuaded if someone should rise from the dead.” Jesus knew His audience well. They were most certainly uncomfortable with this story. How does this message fall upon our ears, hearts, and spirits this day? Do we identify ourselves with any of the cast of characters? 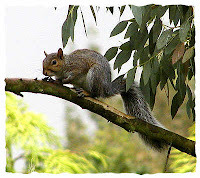 Are we Lazarus; detached from the material world? Do we speak and act, and have hope in an eternal reward. Are we the unnamed, concerned only about the comfort of the moment? We most certainly do not want to spend eternity in torment. Are we the one who proclaims faith in the True God? 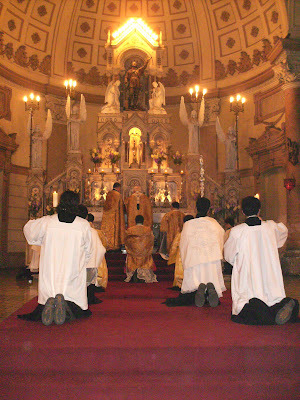 Our authentic Catholic prayer and worship takes us to a glimpse of Heaven. Have we, by word and action, led others to the Promised Land? We have the Deposit of Faith in Sacred Scripture, Sacred Tradition, and the teachings of the Magisterium. Does, by chance, your given name speak to the greatness of God? My names means, “crowned with laurel”—the bay leaf fashioned into a crown as an emblem of victory or distinction. The victory, I hope, is residing with Lazarus. 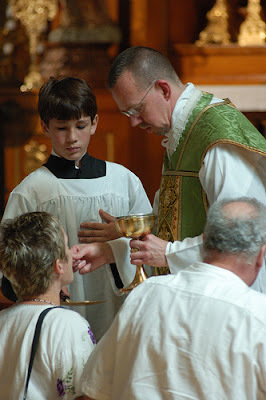 The distinction is a priest of God forever. En el pasaje del Evangelio, Lázaro es pobre, hambriento, y enfermo; sus únicos amigos son los perros que le lamen las llagas. El es el pobre más pobre. Sucio, vestido de garras, era el polo opuesto del hombre rico quien comía y vestía bien. Es significativo el hecho de que él en este pasaje no tiene nombre. Lázaro es en Latín el nombre Hebreo Eleazar que significa “mi Dios ayuda”. Cada uno de nosotros, rico o pobre, satisfecho o hambriento, moriremos. Nuestras almas se irán ya sea a ese lugar de tormentos – el infierno, o a el lugar de comodidad, o temporalmente a un lugar de purificación. Lázaro fue llevado al ceno de Abraham por los ángeles. El nombre de Abraham significa “el padre de muchos”. De hecho, la Iglesia, en su liturgia fúnebre encomienda el alma de los difuntos con éstas palabras: “Cristo que te llamó, te reciba; y los ángeles te conduzcan al ceno de Abraham”. En nuestra muerte somos encomendados a los brazos de la primera persona quien reconoció al Único, Verdadero Dios, Abraham, nuestro padre en la fe. Jesús les dirige esta enseñanza a los Fariseos quienes creían en la resurrección del cuerpo. Al contrario, los Saduceos no creían en esto. Estos líderes religiosos ponían mucha atención a las palabras de Jesús, pues El incluye a Abraham y a Moisés – quien por cierto su nombre significa en Egipcio “hijo” o posiblemente en Hebreo, “repartidor”. Estos líderes religiosos también eran ricos y vestían fino. Ellos sabían que Jesús se refería a su incredulidad cuando dijo, “Si no escuchan a Moisés y a los profetas, no harán caso, ni aunque resucite un muerto”. Jesús conocía bien a sus oyentes. Claramente se sintieron incómodos con esta historia. ¿Cómo cae este día sobre nuestros oídos, nuestros corazones, y nuestros espíritus este mensaje? ¿Nos identificamos con estos personajes? ¿Somos Lázaro; desprendidos del mundo material? ¿Hablamos, actuamos, y tenemos esperanza en una vida eterna? ¿Somos sin nombre, preocupados únicamente por el bienestar del momento? Claramente no queremos pasar la eternidad en tormento. ¿Somos el que proclama la fe en el Único y Verdadero Dios? Nuestra oración y culto Católico autentico nos lleva a una vislumbre del Cielo. ¿Hemos, nosotros, por palabra o acción, guillado a otros hacia la Tierra Prometida? Tenemos el Depósito de Fe en la Sagrada Escritura, la Sagrada Tradición, y las enseñanzas del Magisterio. ¿Quizás su nombre habla de la grandeza de Dios? Mi nombre significa “coronado de laurel” – una corona hecha de laurel como un símbolo de victoria o distinción. La victoria, espero, sea vivir con Lázaro. La distinción es ser sacerdote de Dios por siempre. Que nuestra reflexión de la Palabra de Dios nos incite a que hagamos a un lado las preocupaciones mundanas y pongamos nuestra confianza en las manos de Yeshua, Jesús, que significa “Dios salvador”. Thanks to The New Liturgical Movement blog we have this news via the il Giornale blog: Habemus Praefectum cerimoniarum Summi Pontificis. Here it is being predicted that next week, possibly Monday, Msgr. 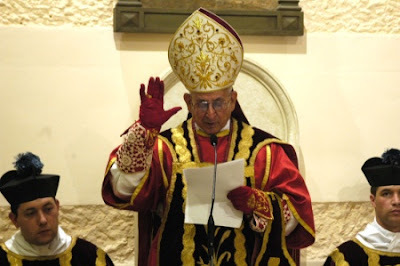 Guido Marini will be named the new Papal Master of Ceremonies, replacing Archbishop Piero Marini. Fr. Zuhlsdorf is carrying the same news at his WDTPRS? Blog. 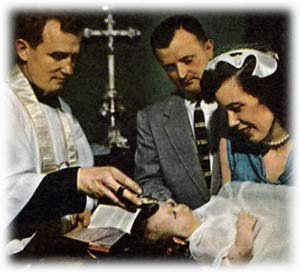 I was asked today to baptize five little souls according to the Traditional Rite. The baptisms are scheduled for Saturday morning, October 20. Deo gratias. I was also approached by an elderly gentlemen for a Requiem Mass when his time comes. Oreo has a new pet. This little guy is living in the small storage room off the patio. Oreo just stares at him wondering how he’d taste with a little Miracle Whip between two slices of marble rye. The faithful of the One, True Church of God continue to be persecuted by Satan’s minions. Good people, be strong, courageous and steadfast in your faith. Do not allow victory to those who believe in harming you with false accusations, vile words, and anger. 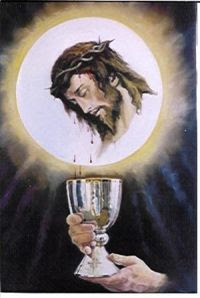 The Sacred Blood of Jesus covers you. CASTEL GANDOLFO, Italy (CNS) — Busy bishops need to put prayer and reflection at the top of their daily agenda, Pope Benedict XVI told a group of recently ordained bishops. Bishops face many demands and time-consuming tasks and duties, “but the top priority in the life of a successor of the apostles must be reserved for God,” he said. The pope’s remarks came during a Sept. 22 audience at the papal summer residence of Castel Gandolfo, south of Rome. He spoke to more than 100 bishops who were attending a meeting in Rome for bishops ordained in the last year. A deeply spiritual and rich prayer life will help the bishop stay close to and imitate Christ, the pope said. It will also help him “become sensitive and merciful toward everyone” and help him discern others’ real needs, he said. “Prayer teaches love and opens the heart to pastoral charity,” enabling the bishop to welcome everyone who turns to him, he said. 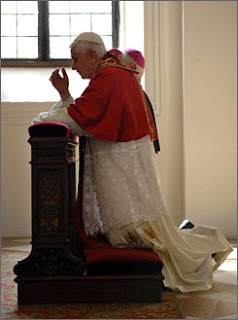 Pope Benedict asked the bishops to pay special attention to their priests in their prayers. Priests will feel encouraged knowing that their bishop is “close to them in prayer, affection, and is always ready to receive, listen to, support and encourage” them, he said. I spent this past week with my brother priests in Flagstaff, as we do once every three years, for a time of study, prayer, and fraternity. The theme was “Cultivating Unity” among us as the presbyterate of the Phoenix Diocese; our relationships with one another and the Bishop. About half-way through the week, Bishop Olmsted shared a quick reflection based on the work we had done up until that point. His words of wisdom guided us through the remainder of our time together. His brief comments were about how we priests manifest the Four Marks of the Church. 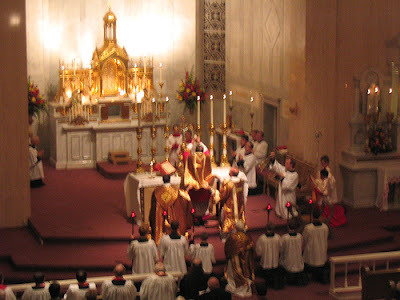 “We believe in One, Holy, Catholic, and Apostolic Church” we say in the Creed. One – By the simple act of gathering together we manifest unity. It is our common beliefs which bring us together. Holy – We believe that we are continuing the Mission and Ministry of Our Lord Jesus Christ through the Sacraments of the Church. Catholic – The Church of God has gone “to the ends of the earth”; we are indeed universal. Apostolic – The faith of the Twelve has been transmitted to us in succession from the first Holy Thursday without interruption. All of this is testimony to the service of God by His priests and His people. We consciously choose to serve God rather than to “serve” mammon, that is, material possessions. Why we are brought together is a mystery. The answer will only come to light when Jesus returns, and establishes the fullness of His kingdom in the New Heaven, and the New Earth. I take seriously my vocation as a priest of God. My vocation prompts me to work on the salvation of my own soul, and the souls of those entrusted to me. I desire the ultimate unity between God and me, and, God and us. Our immortal souls are united to our Creator in heaven by our words and works here on earth. This is the reason I take the teachings, guidance, and wisdom of the Church so seriously. The manner in which we pray is the manner in which we believe; the manner in which we believe is the manner in which we pray. 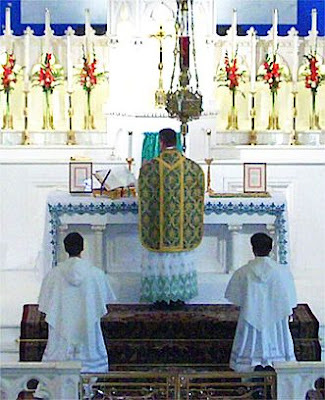 The Holy Sacrifice of the Mass must take us outside of ourselves and place us before those heavenly gates in the moments we find ourselves at the altar. Jesus tells us today: “The person who is trustworthy in very small matters is also trustworthy in great ones…” Small matters: a smile, a handshake, a hug – Great matters: living our faith in Jesus Christ. 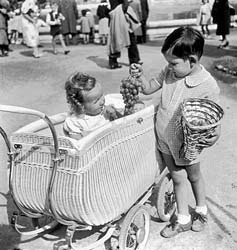 Small matters: our lives of kindness and mercy here on earth – Great matters: living with the God of kindness and mercy forever in Heaven. 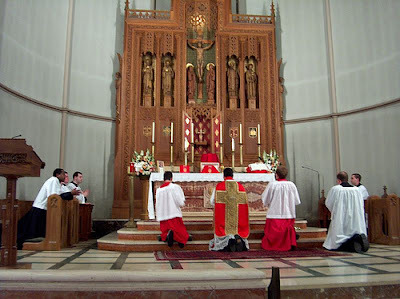 May our authentic worship of God this day manifest the Four Marks of the Church–One, Holy, Catholic, Apostolic–so that our souls may be perfected in the sight of God. Please pray for me as I labor in the vineyard today. 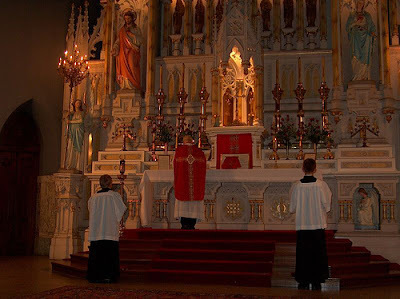 The glory of the Traditional Latin Mass being celebrated by cardinals, bishops, and priests from Chile, to the United States and Europe this past weekend.